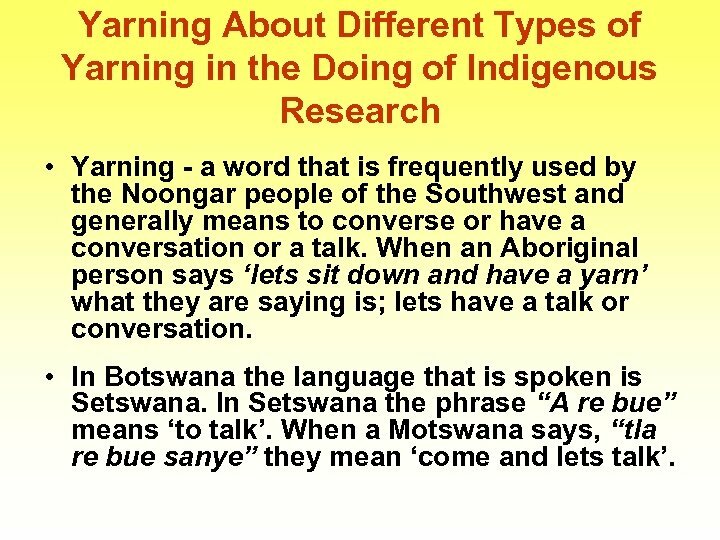 Yarning About Different Types of Yarning in the Doing of Indigenous Research • Yarning - a word that is frequently used by the Noongar people of the Southwest and generally means to converse or have a conversation or a talk. When an Aboriginal person says ‘lets sit down and have a yarn’ what they are saying is; lets have a talk or conversation. • In Botswana the language that is spoken is Setswana. In Setswana the phrase “A re bue” means ‘to talk’. When a Motswana says, “tla re bue sanye” they mean ‘come and lets talk’. Use of Conversation as a research tool. 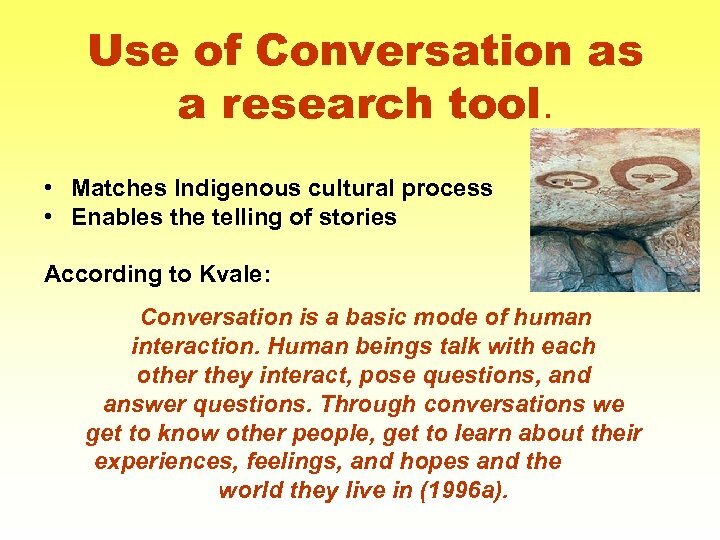 • Matches Indigenous cultural process • Enables the telling of stories According to Kvale: Conversation is a basic mode of human interaction. Human beings talk with each other they interact, pose questions, and answer questions. Through conversations we get to know other people, get to learn about their experiences, feelings, and hopes and the world they live in (1996 a). Yarning About Different Types of Yarning in the Doing of Indigenous Research • Through conversations we can – Learn about people’s experiences, feelings, thoughts and hopes. – There are different types of conversation – that people can have. • Conversations can be social, artistic, political, professional, religious, therapeutic or research focused. 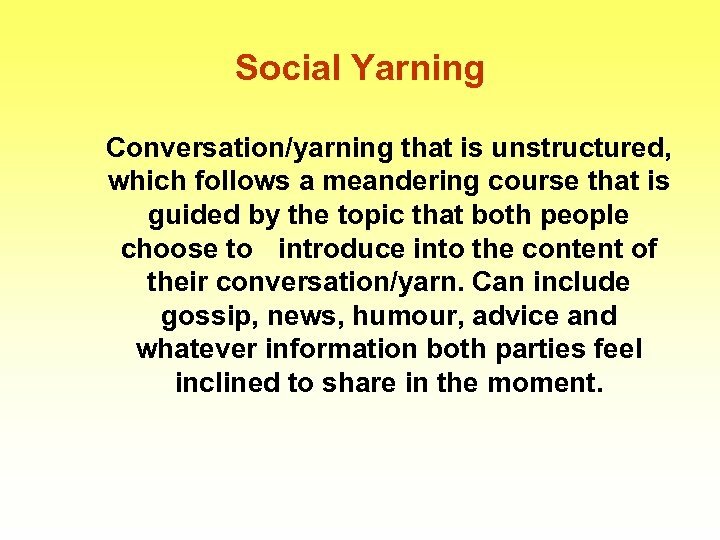 Social Yarning Conversation/yarning that is unstructured, which follows a meandering course that is guided by the topic that both people choose to introduce into the content of their conversation/yarn. Can include gossip, news, humour, advice and whatever information both parties feel inclined to share in the moment. Social Yarning D: Hi John how you going? Good to see you, how you been? J: Good, what about yourself, come inside. D: Thanks, I’ve been pretty busy you know, what with my research and all. J: Oh! Would you like a cuppa? D: Oh! Only if you are having one. Yep, white no sugar. J: Where did you say you were from? (preparing the tea). D: Ok, I’m from Broome you know, my mob are Bardi mob from up the Peninsula. My family name is D and I’m related to the H, T, A, S, A’s on my dad’s side. 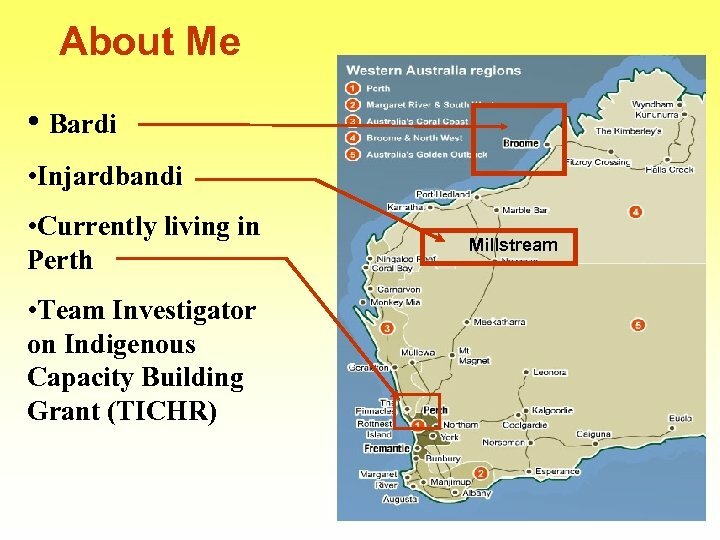 My mum she is from the Pilbara and she is Indjarbadi … You know any of them? Thanks (handed the cup of tea). J: Oh!, what you to KH? D: Oh!, he’s my cousin, you know blackfella way he is my cousin brother, his mom is my mom’s sister. Social Yarning B: Dumela mma? Ke kopa gobona Mma Thabiso. ( How are you Madam? May I please see Mrs Thabiso? ). MT: Dumela. Eehe, ke na. . Tsenang. (Good morning Madam. I am Mrs Thabiso. Come in). I didn’t know that you could speak Setswana. Come on in. Where did you learn Setswana from? Are you married to a Mostwana? B: Oh, no! (I laugh). I lived here in Botswana for nearly 10 years before going to Australia. My parents work here as teachers and live in Moshupa. MT: Oh, that explains the Moshupa connection. I was worried that I will have to be perfect with my English. You know how you people are with research. Everything should be perfect to meet you B: No please don’t worry about being perfect. This is a conversation, and it is not about rights or wrongs. Besides we will be exploring together. Research Yarning Conversation/yarn that is structured around a research interview with the sole purpose of gathering information through the stories that people tell that are related to the research topic. Conversation/yarn of this type is directive and purposeful with a defined beginning and end point. Research Yarning D: I’d like to thank you for agreeing to talk to me today, it’s Wednesday 19 th June. What I’d like to start with is just asking you what sort of experiences you had growing up in your family as girl? Tell me your story, what was it like being a girl in your family? A: I don’t know, we grew up close in the family, very strict, yeah! Research Yarning B: If we could start by you telling me your thoughts about the Botswana AIDS policy, how inclusive was it in the beginning? T: I would not say it was inclusive, if you are saying … talking about how it was formulated or from it’s inception. What they did was that they had a workshop and they invited what they called stakeholders … but then it depends on how many stakeholders you have in HIV/AIDS. Collaborative yarning Conversation which is centered around sharing information around a similar topic. In this case, the collaborative yarning was about the use of conversation in research. In sharing and talking through similar ideas and bouncing different ideas, collaborative yarning enables a shift in thinking, confirmation of what is known and discovery of new concepts/ideas. Therapeutic Yarning T: As I’ve said before that’s one of my greatest heartaches … my greatest shame is that I did hit my partner. D: Did you see anyone when you were growing up hit their partner? T: Yeah, my father was quite aggressive towards my mother at times … I do, remember um, aah, I can’t remember dad hitting her, but I know it did occur … Oh! another time I remember, I was going outside chopping wood, till I wanted to chop him up. For, because he was, they were having a fight inside the house. Therapeutic Yarning B: How big is the issue of stigmatization for people who are HIV positive? N: It is very big. And it is strange because people like you and me, the kind of people you would expect to be educated, they still stigmatize people who have HIV/AIDS. When somebody is sick in the work place, they all seem like, they are supportive, but you can see that some things are just like mockery. B: At this point, I realized that N had a personal story to tell, so I let her continue. N: There is one woman, she works in our registry. The other day I was talking to someone and this person is also supposed to be one of the peer educators, but the way she was talking even irritated me. She was saying ‘you know I don’t want to sit near her, and I hate it because this young woman just takes everybody’s cup’. You expect this person who has trained as a peer educator to be different. The Usefulness of Different Types of Yarning in the Doing of Indigenous Research • Social yarning - is particularly useful for developing rapport and trust in the research relationship. • Research yarning – is purpose driven and is focused on gathering information relating to the research topic. 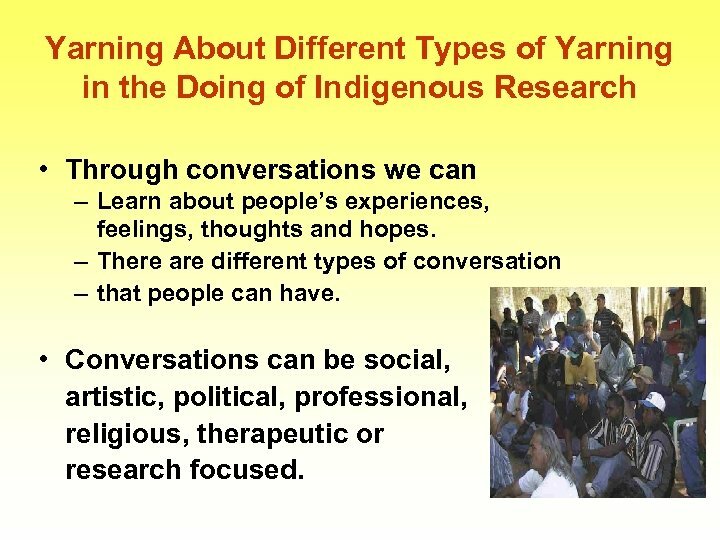 • Collaborative yarning - is extremely useful in sharing information and ideas with colleagues about the research project and can lead to transformation and new meanings for everyone involved. 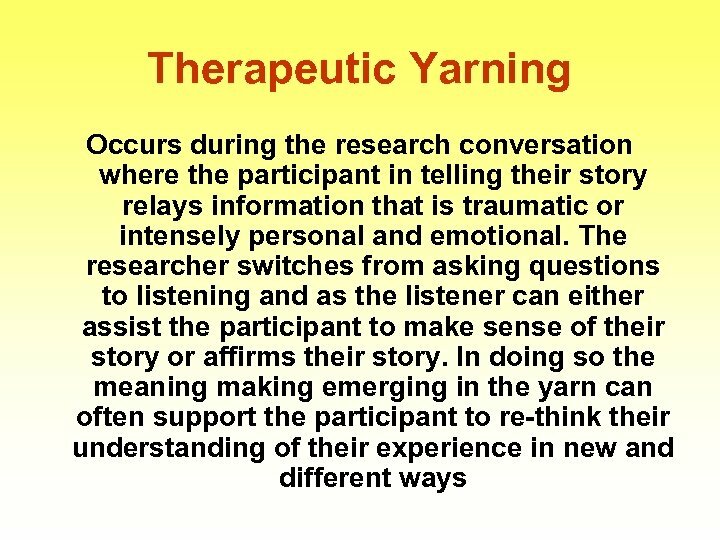 • Therapeutic yarning – is useful when the participant discloses a traumatic or emotional experience or starts to talk about a difficult issue that is creating problems for them. The RY is suspended until the TY is allowed to unfold. Once the participant has had the opportunity to voice their concern, the researcher is then able to return to the research yarn. 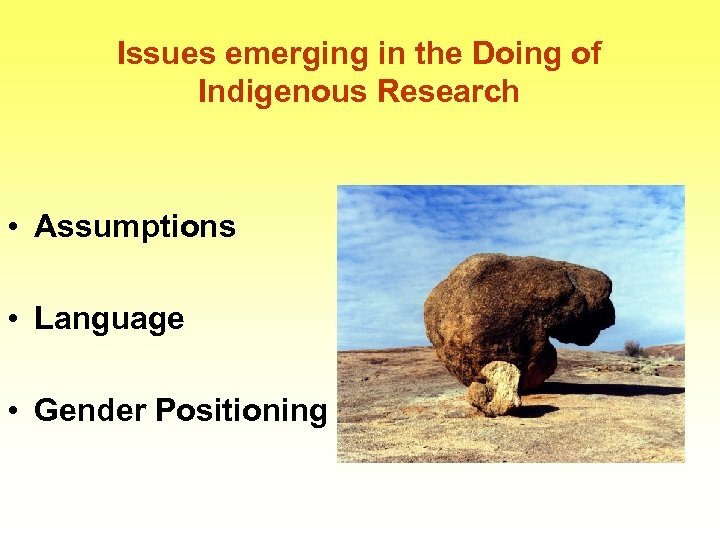 Gender Positioning in the Doing of Indigenous Research R: So, what would you like to know? Tell me what this big project is all about? B: I am conducting research on the HIV/AIDS policy in Botswana… …………………. C: Oh, I guess, I want to tell you my first sexual encounter because I (burst out laughing) might incriminate myself. D: (Laughs) Okay then … but just going back to like your mum and your dad, did your mum have expectations with you as a young boy in the family or as a young man growing up?